We’d like to highlight a few of early 2012’s transactions at small-cap industrial properties around the country. Earthly Body Inc. purchased an approximately 40,000-square-foot building at 21900-21910 Plummer St. in Chatsworth, Cal. for $3.8 million. Yes, there’s a theme here. The new (or soon-to-be) occupants of all these previously unoccupied properties are engaged in a surprisingly resilient sector of the US economy: manufacturing. In other words: they’ll all be making stuff. The Dixon unit will retrofit former Wisco Envelope distribution space to make industrial hose couplings. Cumberland & Western is taking over a facility that once produced tiles – and will do more of the same. Teleflex Medical, an original equipment manufacturer of wide-ranging medical devices, is a subsidiary of publicly traded Teleflex Inc. Sic Lazaro, which is making industrial counterweights at the former Rexcon plant, is one of three Spanish manufacturers retooling Milwaukee plants over the past year alone. And fast-growing Earthly Body, which makes natural skin and body care products, is more than doubling its space as it consolidates operations from three nearby sites. Does this suggest owners and financiers of small-cap industrial properties should feel confident about prospects for leasing or selling empty buildings – and keeping occupants in place? Well, yes and no. Notwithstanding positive short- and longer-term developments of late in many domestic production segments, not all news on the manufacturing front is encouraging. And even as some manufacturers grow, they’re not necessarily hiring unemployed laborers – preferring to churn higher productivity among existing staffers. Still there are plentiful positives to report as the weak dollar makes for globally competitive domestic production in several categories: most notably transportation equipment, chemicals, electronics, machinery, semi-conductors and medical devices. Factories making cars and auto parts led the jump – with output in these combined categories leaping 40 percent. And even outside those fields, output was up a strong 8.3 percent. Durable-goods manufacturing saw exceptional across-the-sector-board gains for the quarter, with overall growth coming in at an annual rate of 15.6 percent. Likewise all the non-durable categories saw noteworthy output gains, posting a collective gain of 5.7 percent on an annual basis. Overall manufacturing capacity utilization ended the quarter at 77.8 percent. While that’s still a scant 1 percent below the historic average, it’s also 14 percent above the mid-2009 cyclical trough. But in this unusually slow and erratic general economic recovery period, skips and starts are inevitable. And indeed an apparent stall in March is raising fears that solid early-year growth might peter out in spring and summer as was the case last year. The Commerce Department in fact reports that orders for factory goods were off by 1.5 percent in March – which represents the poorest monthly performance in three years. However a good chunk of the fall-off relates to the highly erratic commercial aircraft sector – where orders were off nearly 50 percent for the month. Still, orders in all the other sectors combined were essentially flat, following a gain of 1.1 percent in February. Add it all up and March’s orders of $460.5 billion came in 37 percent beyond the recessionary trough three years back. The figure remains below the pre-recession peak in late-2007 – but by just 4.2 percent. Meanwhile the Institute for Supply Management pegged April’s manufacturing growth at the strongest pace in 10 months. Among the 18 segments it tracks, only wood products contracted during the month. Exports aside, one key driver of strengthened manufacturing is that American consumers have been spending more than they had in recent tough years – although not a whole lot more. Accordingly retailers are ordering more goods to stock their shelves – and distributors and manufacturers in turn look to boost inventories. In addition to vehicles and auto parts, clothing and accessories spending has demonstrated strong growth over the past year – up 8.8 percent for the 12 months ending in February), according to the Census Bureau. And growth in the building materials and gardening equipment retailing category was even stronger at 12.5 percent. But the growth isn’t necessarily translating to robust hiring. While manufacturing accounted for a decent 37,000 new jobs in March, employment in the sector in April actually shrank a bit for the first time since September (to the tune of 5,000 positions), according to the ADP National Employment Report. Meanwhile, net absorption, a key element of CRE market fundamentals, likewise reveals steadily recovering demand for manufacturing space. According to figures compiled by Cushman & Wakefield for SmallBalance.com, recession-racked demand started turning around in mid-2010, after overall manufacturing-space occupancy shrank by a whopping 33 million square feet the previous year and nearly 47 million over two years. Absorption has been positive in every quarter except one starting with 2010’s third – the exception being 2011’s first quarter with a negative net of just over 1 million feet. The rebound was generally robust last year with absorption of 3.8 million feet during a very strong second quarter, followed by more than 1.6 million positive in the third and 2.3 million in the last quarter. That put the net for the year beyond 6.6 million – notably beyond 2007’s 4.3 million but still hardly half the 11 million average posted during the 2005-06 bubble biennium. This year’s first quarter came in a bit weaker at less than 1 million – but again, that’s like 2 million better than the year-earlier period on a net basis. 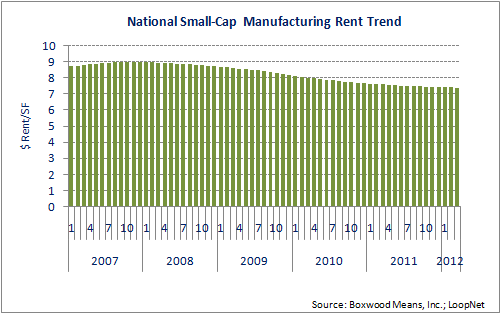 As for nationwide small-cap manufacturing rental-rate trends, Boxwood Means data indicates a decline of about 2.5 percent – to $7.39 per square foot annually – for the 12 months ending in March. The better news for landlords is that the March figure represents the smallest year-over-year decline since the financial melt-down month of October 2008. For small-cap industrial space generally, Boxwood indicates that the average number of days it takes to fill empty space was 207 in March – down from the cyclical peak of 219 seen in May 2011.